One of my favourite parts of attending the ever-growing Alteryx Inspire 2016 conference and its like is hearing about the fun new features that tools such as the wonderful Alteryx are going to make available soon. It’s always exciting to think about how such developments might improve our job efficiency, satisfaction or enable whole new activities that so far have not been practical. From this blog’s page view stats, it seems like others out in the great mysterious internet also find that sort of topic interesting, so below are a few notes I made from the various public sessions I was lucky enough to attend, about some of what Alteryx is thinking to add over the next few versions. The Adobe Analytics connector was recently released (here’s how to use it) – they plan further refinements to it. Nothing in particular was specified, but users are invited to send in their ideas. A connector for Salesforce Wave. Text classification tools, to enable e.g. sentiment analysis, key phrase extraction, language detection, topic modelling. An analytic app that will allow you to install your own choice of R packages from CRAN. How does a price change impact my bottom line? How can I predict how much a customer will spend? How can I predict whether a customer will buy the produce I put on sale? Optimisation: have Alteryx maximise or minimise a value based on constraints for an optimum outcome. One example demonstrated was “what’s the best product mix to stock on a shop shelf to maximise profits, whilst ensuring the shelf has no more than 1 of any particular item?”. Simulation: think here of things like Monte Carlo simulations, and, in the future, agent-based simulations. a data preview to show you right away what the results of your formula will be on a sample record. This one makes me happy! Without meaning to cause offence, the current incarnation of the formula tool, which has to be one of the most used tools for most everyone, is a little…erm…”old fashioned” to those of us spoilt with auto-correcty/lookup things from other vendors in recent times when typing in code. No more digging around trying to remember if a function to create a date is under “date/time” or “conversion” etc. Row level security on data, i.e. different users see different records in the same datasource. Version 10.6 may be around the end of this month. Version 11 towards the end of the year (no promises made). I did not note which features were planned for which version. Alteryx released their new version 10.1 this week – license holders/demo seekers can pop along to the download page to install it. The concept is simple: process/model/advanced-analyse your data in Alteryx and then it will push up the results as a Tableau data source which all your Tableau Server or Tableau Online users can use in their Tableau workbooks. If you set it up nicely, you could therefore have it auto-update a bunch of complicated datasources with one click of a button. As the community of Tableau users gets ever more integrated with the community of Alteryx users, this is a pretty exciting development. In fairness, the geniuses at the Information Lab had already enabled this via a couple of nice macros they were kind enough to distribute – but I guess to see this made a feature of the core software itself at least shows that what they did was highly desired! After quickly installing 10.1 though, I couldn’t find the tool immediately. It turns out you need to download and install it. It’s very easy to do, but below are some notes on the process to follow, and how to configure the tool if you use Tableau Online, rather than Tableau Server. Firstly, make sure you have installed Alteryx 10.1. Get it here. Then go download the “Publish to Tableau Server” tool from the Alteryx Analytics Gallery. Double-click to run it once you have downloaded it and it will open in Alteryx. Press the toolbar button for “Run as an an alytic app”. This is not the usual “play” triangle, but rather the one that looks like a wand next to it. Close and restart Alteryx – and now you should have the sparkly new Publish to Tableau Server tool available. As with any other Alteryx tool, pop it into your workflow such that the data you want uploading to Tableau Online/Server is going into its input. The output it passes on will be the same as whatever input you gave it, so you can continue processing the data in Alteryx after the upload has happened. Click on the Publish tool and you will see you have to configure 2 tabs: Connection and Output. The “Use default site” option will not work for Tableau Online. This is presumably because there is not really a default site when a single server is being used by a large number of different customers! 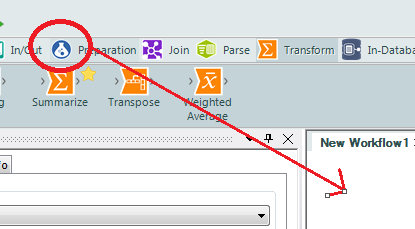 Manually type in the name of your Tableau online site, which you can find in the URL of your web browser again when you log into Tableau Online after the “/site/” bit. It’s probably the name of your company or something similar (if you’re working in a company). You can then use the “Output” tab of the configuration to specify the project, data source and so on to save to. Then just hit the normal “run” button, wait a couple of minutes until Alteryx tells you it’s finished, and you should find you have a nice new datasource in your Tableau Online site. Alteryx version 10 was recently released, with all sorts of juicy new features in realms such as usability, data manipulation and statistical modelling. Perhaps one of the most interesting ones for me though is the new Network Analysis tool. This provides an easy way to make network graph visualisations natively, something that many general purpose analytical tools don’t do (or require workarounds). Behind the scenes, it uses R, but, as per the other Alteryx R tools, you don’t need to worry about that. Until now, I had used the Gephi for such work; it’s a great free open-source program which is tremendously capable at this style of analysis, but not always particularly friendly or easy to use, and requires data to be exported into it. First create your tables of nodes (the dots) and edges (the lines between the dots). The documentation states that your nodes must have a unique identifier with the fieldname of “_name_” and the edges must have fields “from” and “to”. 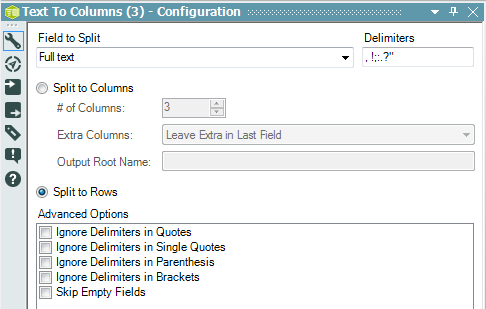 Actually in practice I found it often works fine even without using those specific field names, but it is to rename columns in Alteryx (use the Select tool for instance) so one might as well follow the instructions where possible. Pop a “Network Analysis” tool onto the canvas. 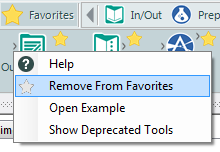 It’s in the Predictive section of the Alteryx toolbar. Then hook up your nodes file to the N input and edges file to the E input. There’s some configuration options on the Network Analysis tool I’ll mention briefly shortly, but for now, that’s it, job done! Press the run button and enjoy the results. The D output of the tool gives you a data table, 1 row per node, showing various graph-related statistics per node: betweenness, degree, closeness, pagerank and evcent. You can then directly use these statistics later on in your workflow. Although for most tools the “auto-browse” function of Alteryx 10 negates the need for a Browse tool, you will need one connected to the I output if you want to see the graphic representation of your network. There are some useful configuration options in the Network Visualisation tool itself in 3 categories; nodes, edges and layout. ability to have directed (A connects to B, B might not connect to A) or undirected (A connects to B implies B connects to A) edges. 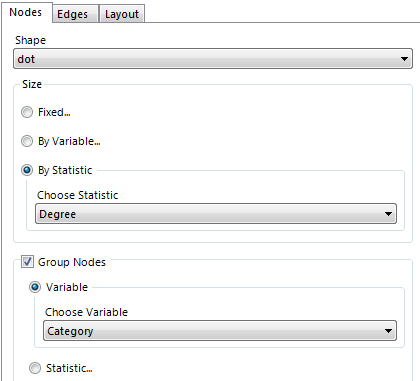 ability to group nodes by either network statistics or another variable (e.g. to differentiate between Facebook friends and Facebook groups). 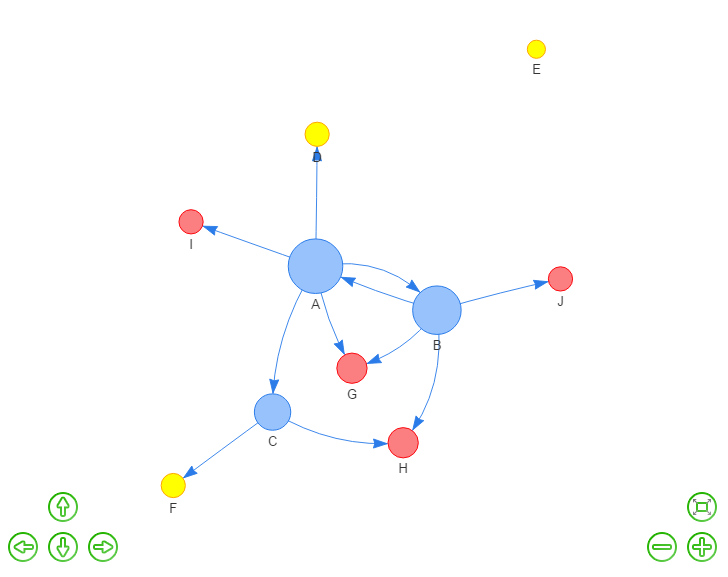 Here for example is the above diagram where the nodes are sized by degree (# connections), coloured by my variable “Category” and the edges are set to directed. Sidenote 1: There seems to be a trick to getting the group-by-variable to work though, which I’m not sure is intentional(?). I found that the tool would only recognise my grouping variables if they were specifically of type “String”. Sidenote 2: For people like me who are locked down to an old version of Internet Explorer (!) – the happy news is that the Alteryx network viz works even in that situation. In previous versions of Alteryx I found that the “interactive” visualisations tended to fail if one had an old version of IE installed. Overall, the tool seems to work well, and is as quick and easy to use as users of Alteryx have probably come to expect. It even, dare I say it, has an element of fun to it. It’s not going to rival – and probably never will try to – the flexibility of Gephi for those hand-crafting large complex networks with a need for in-depth customisation options and output. Stick with that if you need the more advanced features (or if you can’t afford to buy Alteryx!). But for many people, I believe it contains enough features even in this first version to do the basics of what most analysts probably want a network viz for, and will save you hours in comparison vs finding and learning another package. At least for relatively small numbers of nodes anyway; on my first try I found it hard to gain much insight from the display of a larger network as the viewing area was quite small – but some of this is innate to the nature of the visualisation type itself. I have also not yet experimented very much with the different layout options available, some of which might dramatically improve things if they have similar impact to the Gephi layout options. Picking the optimum location to display each node is a distinctly non-trivial task for software to do! Remember also that as the “D” output gives a data table of network stats per node, one could always use that output to pre-filter another incarnation of the network viz tool and show only the most “interesting” nodes if that was more useful. 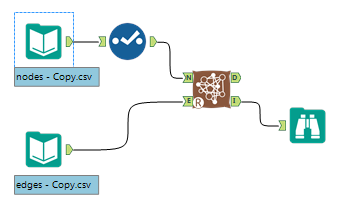 In general this new Alteryx tool is so easy to use and gives such quick results that I hope to see it promote effective use of such diagrams in real-world situations where they can be useful. At the very least, I’m sure it’ll convince a few new “data artisans” to give network analysis a try. Free text analytics seems a fashionable pastime at present. The most commonly seen form in the wild might be the very basic text visualisation known as the “word cloud”. Here, for instance is the New York Times’ “most searched for terms” represented in such a cloud. When confronted with a body of human-written text, one of the first steps for many text-related analytical techniques is tokenisation. This is the process where one decomposes the lengthy scrawlings received from a human into suitable units for data mining; for example sentences, paragraphs or words. Here we will consider splitting text up into individual words with a view to later processing. Let’s imagine I want to know how many times each word occurs. For instance, “Alteryx” appears in there twice. remove all the “common” words that tend to dominate such analysis whilst adding little insight – “I”, “You” etc. ignore capitalisation: the word ALTERYX should be considered the same as Alteryx for example. Alteryx has the tools to do a basic version of this in just a few seconds. Here’s a summary of one possible approach. First I used an Input tool to connect to my datasource which contained the free text for parsing. The key manipulation was then done using the “Text To Columns” tool. Two configuration options were particularly helpful here. Despite its name, it has a configuration option to split your text to rows, rather than columns.This is great for this type of thing because each field might contains a different, and unknown amount of words in in – and for most analytic techniques it is often easier to handle a table of unknown length than one of unknown width. You will still be able to track which record each row originally came from as Alteryx preserves the fields that you do not split on each record, similar to how the “Transpose” tool works. You can enter several delimiters – and it will consider any of them independently. The list I used was ', !;:.?"' , meaning I wanted to consider that a new word started or ended whenever I saw a comma, space, full stop, question mark and so on. You can add as many as you like, according to how your data is formatted. Note also the advanced options at the bottom if you want to ignore delimiters in certain circumstances. When one runs the tool, if there are several delimiters next to each other, this will (correctly) cause rows with blank “words” to be generated. These are easily removed with a Filter tool, set to exclude any record where the text IsEmpty(). Next I wanted to remove the most common basic words, such that I don’t end up with a frequency table filled with “and” or “I” for instance. These are often called stopwords. But how to choose them? which results in a list of 127 such words – I, me, my, myself etc. You can see the full current list on my spreadsheet: NLTK stopwords. 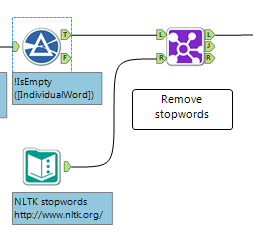 I loaded these into an Alteryx text input tool, and used a Join tool to connect the words my previous text generated (on the left side) to the words in this stopword corpus (on the right side), and took the left-hand output of the join tool. The overall effect of this is what relational database fans might call a LEFT JOIN: an output that gives me all of the records from my processed text that do not match those in the stopword corpus. (Alteryx has a nice “translate from SQL to Alteryx” page in the knowledgebase for people looking to recreate something they did in SQL in this new-fangled Alteryx tool). The output of that Join tool is therefore the end result; 1 record for each word in your original text, tokenised, that is not in the list of common words. This is a useful format for carrying on to analyse in Alteryx or most other relevant tools. If you wanted to do a quick frequency count within Alteryx for instance, you can do this in seconds by dropping in a Summarise tool that counts each record, grouping by the word itself. You can download the full workflow shown above here. SPSS is a nice statistics/analytics package that, since 1968 (! ), seems to have been well-regarded program for classic statistics. It now has many new bits and pieces that target the predictive modelling market too. In my experience it was previously mostly used in academia, especially the social sciences, but these days it seems it has made inroads into business and government data too.But it’s not yet common enough that we all have a copy sadly, and hence I faced a challenge of how to use a large data file in SPSS format within the other tools at our disposal. variable labels: e.g. a field called “QUESTION13PARTB” might have the label “What is your gender?”. factors (a.k.a. value labels): meaning the answers to that question might actually be saved in the data as 0 or 1, they actually represent female” or “male”. “QUESTION13PARTB:0” I could get “What is your gender? : Female”. Alteryx default settings can get you part of the way there very easily. When used on an SPSS (*.SAV) file the “Input Data” tool has an option to “expand factors”. If not ticked you’ll get 0 or 1 in the above example, if ticked you get female or male. Super easy. But I could not find a way to extract the variable labels, i.e. translate QUESTION13PARTB into “What is your gender?”. Alteryx Analytics Gallery to the rescue! It has a freely downloadable SPSS Input tool there which neatly slots into your Alteryx Designer software, courtesy of Neil Ryan. Upon use you get the following options, which you can see pretty perfectly coincide with the task at hand. The concept of SPSS Variable Labels is pretty much the same as Alteryx field descriptions, so the second tickbox there is basically recreating the original SPSS setup but in Alteryx. You will see the field descriptions in Alteryx tools like the select tool in that case – or you have the first option which literally replaces the coded field names with their SPSS descriptions if you prefer. The gallery does warn that this tool is not super fast. I would agree, the default Alteryx input tool is much faster – but even with a recordset in the hundreds of thousands with a with of a few hundred columns I only had to remain patient for about 5 minutes before it was done. Those without Alteryx – you can do this all in R (indeed that is apparently how this Alteryx tool actually works) – but it will quite possibly be a much less friendly experience if you’re coming to it from scratch! Here’s some docs on the read.spss command you might start from though for any r-curious.